Here’s another photo from the summer, of Mt. St. Elias rising above Icy Bay. Good times. This entry was posted in Adventures, Alaska, Kayaking, Landscapes, Travel, Wrangell - St. Elias National Park on November 6, 2008 by Carl D.
Considering the summer, you were fortunate on the weather down there. Mt. St. Elias is such an awesome mountain. I think it’s my new favorite. Long time, no talk. This photo is amazing – bet that puppy looks great nice ‘n big! Good to see some sun in AK this year! I think we saw the sun about 6 hours during our trip to Katmai this September. Lots of rain … well, enough to make me start thinking that anyone living in AK is slightly nuts! 🙂 The thing that really bugged us (besides our truck breaking down in Soldotna) was that we had kind of a crappy summer here for hiking – always running into thunderstorms while peaking out, and more than a few rainy weekends. Then when we left for AK, we apparently had three weeks of glorious sunny indian summer here! Arrrggg. That said, we did have a really good October for hiking, so I suppose we can’t grouse too much. I read that you’re taking up snowboarding. Crazy boy, everyone knows that real men still ski! Hey Carl! Great pic! I love the flowers & then the snowy mountain backdrop. Have you broken any bones yet on your board? Actually, I think you’ll be pretty good. Hey, when you get a minute, can you answer my question on the previous post? I’d really like to learn what that is. Thanks!! Stay safe, as always!! P.S. Hey Ron. You’ve been taking some awesome pics!! Carl, you gotta find The Blue Bear!!! Bummer about your weather this summer. Seemed to be par for the course, eh? I was actually lucky, I didn’t get TOO much rain – really just one trip was really soaking. Most of the others were cloudy, with scattered showers, but not as much rain as 2 years ago. Glad you got some nice weather in October though – great time of year to be in your area. On the snowboarding, you know I really want to get a split board, so I can do both. Boarding’s definitely cooler than skiing. And I need the cool points. Thanks – it’s one of my favorites from the summer, I think. So far, no broken bones. If my snow boarding learning curve is anything like mountain biking, it’ll take about 8 months. It’s a ton of fun so far. Glad you’re having a blast! Mt. 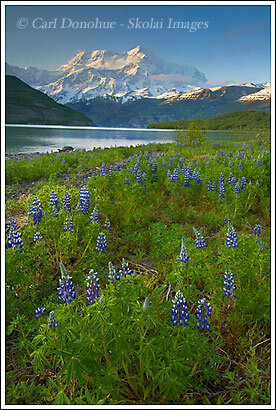 Saint Elias is my favorite mountain. So beautiful!! Don’t tell me you are growing tired of the Alaskan winter already with all these summer shots. 🙂 Killer shot though – amazing view. Thanks, man. No, I’m not tired of the winter here. it hasn’t even really started yet. I’m looking forward to some more snow soon. The view at Icy Bay is simply amazing. I can’t think of a better one.